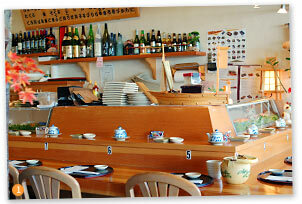 Photos: 1,2) Our front dining room features natural woods and a long sushi bar. 3) Try our mouth-watering spicy tuna. 4) A sushi platter — the life of any party. Since 1991, San Francisco's Noriega Teriyaki House has provided top-quality Japanese dining in a relaxed and attractive setting. Fresh fish and creative combinations are the hallmarks of our menu. Each sushi roll in our wide selection arrives gracefully crafted and impeccably garnished. Our cooked items include a range of noodles, tempura, teriyaki, combination dinners and dessert. Located in the Sunset District, we're a popular dining spot for birthday parties, rehearsal dinners, red egg & ginger parties and baptism celebrations. Our customers enjoy a wide choice of seating: cozy booths, sunny window tables, the sushi bar, or a private dining room for groups up to 25. Whether couples, solo diners, families or groups of friends — all are welcome! If you can't come to Noriega Teriyaki, then let us come to you. Our catered bento boxes and party trays are a popular choice for corporate lunches and other events. Our sushi chefs and servers bring our friendly professionalism with us wherever we go. We offer free delivery to locations in the Sunset and the Richmond. Noriega Teriyaki House is open for lunch and dinner. We accept reservations for parties of six or more. Gift certificates are available. Join us! Sunday, Wednesday, Thursday, 11 A.M. – 9:30 P.M.
Monday and Tuesday, 4 P.M. – 9:30 P.M.
Friday and Saturday, 11 A.M. – 10 P.M.